Yellowtail kingfish are a marine fish with a circumglobal distribution, and are an important sport fish and aquaculture species in the southern hemisphere. My PhD thesis investigated the ontogenetic (age-related) development of metabolism in yellowtail kingfish. I worked with colleagues at the NIWA Bream Bay Aquaculture Park (northern New Zealand) to characterise reproductive behaviour and early development. The adult fish were kept in large indoor tanks, where water temperature and photoperiod could be controlled to simulate the spawning conditions the fish experience in the wild. Analysis of the spawning behaviour showed that typically one female would spawn with one or two males at a time. The spawned eggs were positively buoyant, approximately 1 mm in diameter, and like many other marine fish species, the eggs had a single oil droplet inside. Eggs were collected from the water surface and incubated. 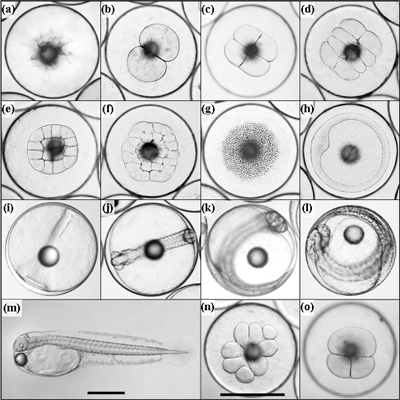 Developmental stages and cleavage abnormalities of yellowtail kingfish: (a) pre-cleavage; (b) 2 cell; (c) 4 cell; (d) 8 cell; (e) 16 cell; (f) 32 cell; (g) mid-stage blastula; (h) gastrula; (i) appearance of embryo; (j) 20 myomere embryo; (k) advanced embryo; (l) pre-hatch embryo; (m) larva 4 hours post-hatch; (n) asymmetrical cleavage in blastula; (o) indistinct cell margins in blastula. Scale bar for (a)-(l) and (n)-(o) shown in (n); scale bars represent 1 mm. Hatching time was 60-120 hours depending on the incubation temperature. The oil droplet volume decreased during embryonic and larval development. 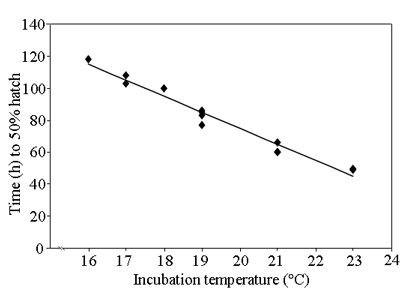 Effect of temperature on oil droplet volume during egg and early larval development of yellowtail kingfish. 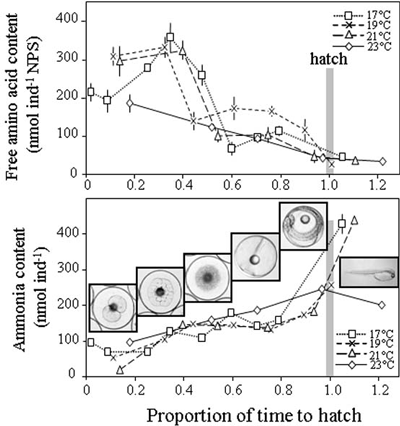 Although the oil droplet volume decreased, work by Hilton et al showed that the total body lipid content remains fairly constant during the embryonic and pre-feeding larval phase. Total body protein and glucose/glycogen content was not found to change significantly, so neither lipid, protein nor carbohydrate was the pre-feeding energy source. A rapid decrease in the concentration of free amino acids (i.e. not bound into proteins) was observed along with an increase in ammonia concentration (a waste product of amino acid break down). This suggests that yellowtail kingfish predominately use free amino acids as an energy source during the pre-feeding phase of development. Change in free amino acid content and ammonia inside eggs of yellowtail kingfish at different temperatures. 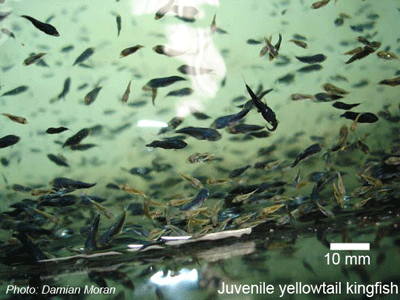 Just like other fish species, larval and juvenile yellowtail kingfish grow very rapidly. After hatching, the larval fish eat small planktonic animals. During the first few weeks of feeding there is large variation in growth rates between individuals. It is difficult to study small larval fish in the wide expanse of the ocean, but you can see just how much size variation can occur when larvae are raised in tanks for aquaculture. Aquaculture researchers and marine biologists aren't really sure why there is so much variation - is it related to food availability, individual differences in food capture capability and nutrient assimilation efficiency, or aggressive interactions between hungry little predators? The answer is likely a mixture of all of these. A cohort of sibling yellowtail kingfish at 20 days post hatch. Note the large variation in size. We did an experiment to see if the stocking density of newly hatched larvae affected growth and survival while trying to keep live prey abundance constant. The stocking densities were 40, 60 and 100 larvae per litre. 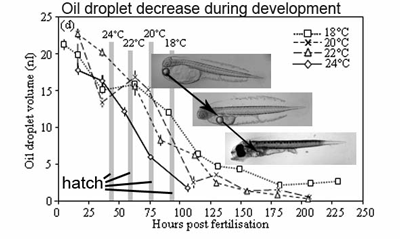 The average length of larvae tended to be larger at lower stocking densities for the first 2 weeks (see graph below), suggesting that the larvae must have been depleting the rotifers (live feed) fast enough between re-fills that food was limiting at the higher stocking densities. However, the effect of initial stocking density on larval size was greatly diminished by 30 days post hatch. Mean total length, LT (±SD), of yellowtail kingfish juveniles at different initial stocking densities. The statistical effect size (partial eta-squared) of larval density and replicate variation is given above each sampling point. Bars that share the same letter within each sampling day are not significantly different. One very striking result at the end of the larval density trial was the very strong relationship between cohort mortality rate, average larval weight, and size variation. It appears that the size distribution characteristics of a sibling cohort is strongly dependent on the rate of mortality. It was unclear what the source of mortality was from the study (there was a pretty high quantity of food, and virtually no cannibalism at this stage). What was clear was that the mortality probability for an individual larva was very strongly linked to its 'growth potential' - the lower the growth potential, the higher the probability of dying. Is this important in the wild? Difficult to know, but it would be worth investigating given our lack of knowledge about what determines survival of fish larvae in the ocean. Aggression and cannibalism can be intense in juvenile yellowtail kingfish after 30 days post hatch. 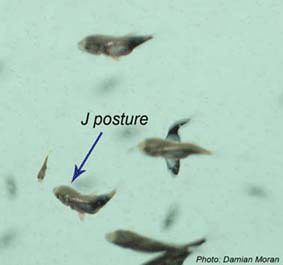 The beginning of juvenile aggression is observed as larger individuals assuming a J-shaped attack posture while tracking smaller subordinates. This behaviour starts at around 12 DPH. At around 18 DPH some of the large individuals start chasing and nipping other juveniles. From 30 DPH you can observe large fish ingesting smaller fish. This can result in both the predator and prey dying, as the larger juveniles are not yet able to properly swallow their prey and they have a poor ability to regurgitate. Not all of the large individuals are equally aggressive, some are clearly more aggressive than others. If these juvenile cohorts are not size graded the cannibalism can wipe out most of the cohort. I undertook a trial to investigate just how effective size grading was in reducing aggression and improving the growth of the smaller individuals, which are most often the recipients of aggression. Juveniles from a single cohort were graded into three sizes at 28 DPH: small (42% of cohort), medium (50%) and large (8%). The large fish were easily recognisable as exceptionally large individuals, and the small individuals were very small and often yellowish in colour. The medium size grade where those that were in between the large and small grade juveniles. 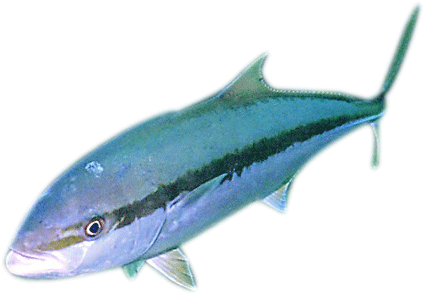 A cohort of sibling juvenile yellowtail kingfish was graded into three sizes. The juveniles were grown for 12 days in size graded and ungraded (control) treatments. Growth rate, aggressive behaviour and RNA:DNA ratio were monitored during the trial. There was a statistically significant increase in average weight for groups except the small grade of juveniles. The smallest juvenile recorded in the control group at the end of the trial was bigger than most of the juveniles in the small grade. Change in average individual weight over the grading trial. Some fish were grown with indviduals of a similar size, others were grown in a mix of size classes. Aggressive behaviour was only seen in the control groups. The large grade juveniles did not show aggression, indicating that size variation is a key factor in promoting aggressive behaviour. The medium grade did not display any aggressive behaviour, despite having a similar average weight and size variation as the control groups at the end of the trial. The conclusion is that aggression is only carried out by some fast growing individuals when there is size variation. Mortality was high in the medium and small grade, even though no aggressive behaviour was observed in these groups. The control group had a similar survival profile to the medium and small grade, which was probably related to the fact that the ungraded population was mostly composed of small and medium individuals. The large juveniles had a much higher survival rate than all of these groups. The RNA:DNA ratio was used to measure the growth rate of individuals before and after grading. While the amount of DNA is fixed per cell, the amount of RNA varies depending how much protein is being produced (in a process called transcription). Juvenile fish grow very fast and have a high proportion of muscle in their body, and muscle is made of protein. If one measures a high mass of RNA compared to DNA, it means a lot of protein is being produced and the fish is growing fast (e.g. RNA=3, DNA=1). Conversely, if growth is low, the protein production rate will be lower (e.g. RNA=1, DNA=1). The RNA:DNA ratio can give you a snapshot of the relative growth rate at one time point, something that can't be derived from a single weight measurement. Below is a graph of the RNA:DNA ratio of the different size grades before and after the grading trial. The small grade decreased in RNA:DNA ratio to a value near 1, indicative of starvation. There was a clear correlation between RNA:DNA ratio and weight for the other size grades. This goes against what one may have predicted, as the correlation implies that faster growing fish (i.e. 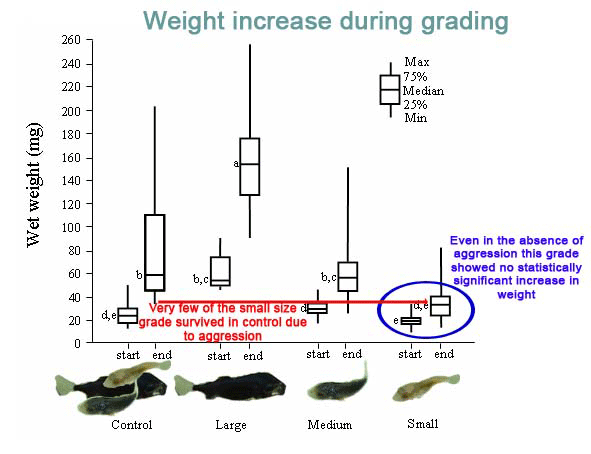 the large grade) have the same RNA:DNA ratio as slower growing fish for any given weight. If RNA:DNA ratio was a useful reflection of instantaneous growth rate, it would be expected that the faster growing fish would have a higher RNA:DNA ratio than fish with lower growth rates for any given weight. One explanation for the results is that the while the amount of RNA present may be similar for two fish of different growth rates at any given weight (i.e. the same RNA:DNA ratio), the rate of RNA turnover may be higher in the faster growing fish. Alternatively, the RNA:DNA ratio may be constrained by upstream processes that better reflect growth rate. Average RNA:DNA ratio of individuals at the start and end of the size grading trial. Meyer, S., Caldarone, E.M., Chicharo, M.A., Clemmesen-Bockelmann, C., Folkvord, A., Holt, G.J., Høie, H., Malzahn, A., Moran, D., Petereit, C., Støttrup, J.G., Peck, M.A. (2011). 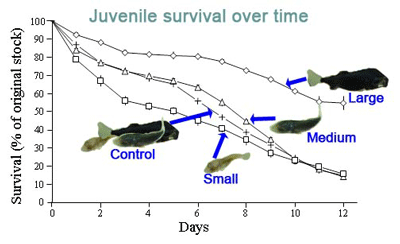 On the edge of death: Rates of decline and lower thresholds of biochemical condition in food-deprived fish larvae and juveniles. Journal of Marine Systems 93: 11-24. Moran, D., Smith, C.K., Lee, P.S., Pether, S.J., (2011). Mortality structures population size characteristics of juvenile yellowtail kingfish (Seriola lalandi Valenciennes) reared at different densities. Aquatic Biology 11: 229-238. Moran, D.; Smith, C. K.; Gara, B. G.; Poortenaar, C.W. (2007). Reproductive behaviour and egg development in yellowtail kingfish (Seriola lalandi Valenciennes 1833). Aquaculture 262: 95-104. Moran, D.; Wells, R. M. G.; Gara, B. G. (2007). Energetics and metabolism of yellowtail kingfish (Seriola lalandi Valenciennes 1833) during embryogenesis. Aquaculture 265: 359-369. Moran, D. (2007). Size heterogeneity, growth potential and aggression in juvenile yellowtail kingfish (Seriola lalandi Valenciennes). Aquaculture Research 38: 1254-1264. This research was funded by the NZ Foundation for Research Science and Technology, and I was supported by a NZ Tertiary Education Commission Bright Futures Doctoral Scholarship, A NZFRST Fellowship and a Marie Curie Intra-European Fellowship.